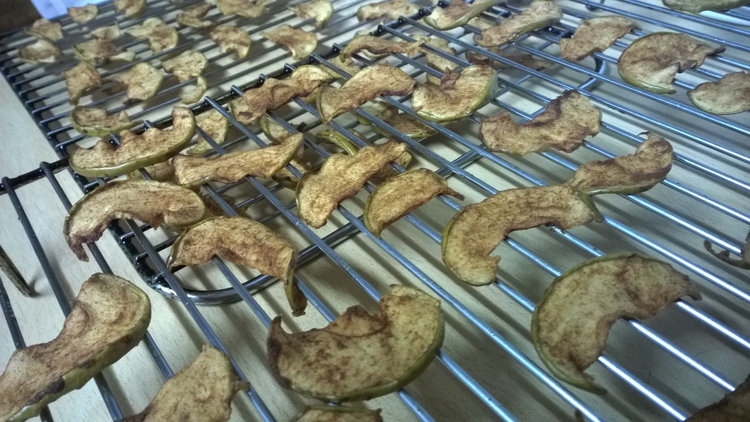 Yummy munchy crispy apple snacks flavoured with vanilla and cinnamon. 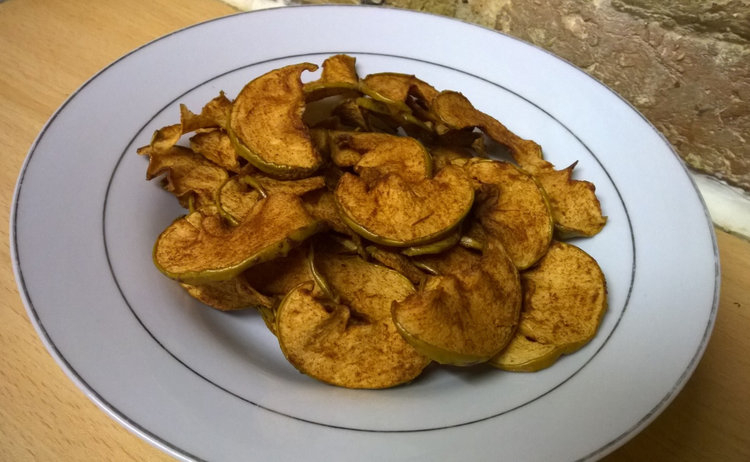 This is my take on apple chips. Trust me, you’ll love ’em! – 2 Bramley apples (or other cooking apple), approx 400-450g BC (BC = Before coring, I just made that up, do you like it?). – 2 generous teaspoons cinnamon. – 2 generous teaspoons vanilla extract. – 2 generous teaspoons oil, plus extra for greasing (As always, I like groundnut oil for this sort of thing, but vegetable oil would be fine, not olive oil though as it would impart a flavour that wouldn’t be good here). Bramley apples are very tart and I love that about them, balanced out with the subtle natural sweetness of the cinnamon and vanilla in this recipe. However, if you prefer sweeter things, you may want to add some sugar in with the cinnamon. If you can’t get Bramley or cooking apples, you could use eating apples, but do try to go for the tartest ones you can find, so probably Granny Smiths (but Bramleys are best!). 1. Mix the cinnamon, vanilla essence, and oil together well. 2. 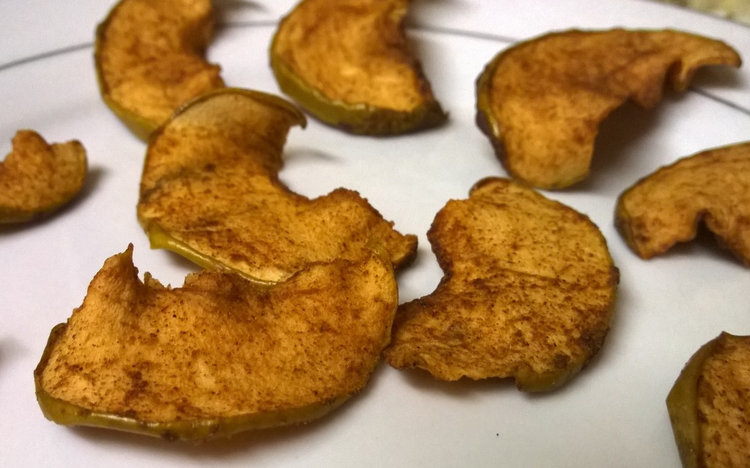 Core, but don’t peel the apples, cut them into thin slices, about 3mm thick. If you have a mandolin or food processor with slicing attachment, it will of course be easier. Otherwise, a sharp knife and care. The apples will shrink a lot during cooking so if you are using eating apples (which are smaller than cooking apples), it would be better to cut full size apple rings rather than the quartered slices I did. 3. Lightly brush the cinnamon mixture on both sides of the slices. If you don’t have enough mixture then you weren’t brushing lightly enough. 4. Lightly brush oil onto tray racks – you can just use baking sheets lined with baking paper (which should also be lightly oiled), but I like the racks so that the heat can circulate underneath the slices. Place the slices in a single layer on the racks or trays. 5. The key to getting these crispy is slow cooking on a low heat, so place them in an oven at 100C/210F for two to three hours, checking them and turning the trays regularly until they are crispy, if you have them on racks you shouldn’t need to flip the slices themselves, otherwise do. 6. Switch the oven off and leave them in there with the door closed for another hour, this will help to dry them out further as the oven cools. Remove from oven and leave to cool completely. Sorry about the washed out colour on this pic! If you’ve done it right, they will be light and crispy, and stored in an airtight container, will still be crispy the next day (don’t know about after that, they didn’t last that long). Much nicer than bought ones, and as a bonus they smell wonderful while cooking! Something’s going on at WP. I started to comment on someone post and the lettering became so tiny I couldn’t see what I was typing. Another day, I asked a blogger when she’d changed her theme. She hadn’t. When I read her post the theme was more narrow than ever, and the font was huge. The next day, everything was okay again. I have noticed, while replying to comments this past week, the line spacing is crammed together but when I click Reply, it looks okay posted. Now you come to mention it, I’ve noticed strange things with font sizes on WordPress when I’m typing comments, and I’ve thought it was something wrong with the settings on my computer, but then as you say it goes back to normal. I got a notification in my email! And I’v never heard of Bramley apples (I like the name! ), so I guess across the pond we’d have to use Granny Smiths. It’s a very British sounding name isn’t it! Other cooking apples would do too, not sure if you have cooking apples specifically do you? They’re usually quite a bit bigger, and sourer even than Granny Smiths. I thought Bramleys were internationally considered THE cooking apple? Can’t remember where I heard this, but I felt it was asserted with some confidence. I know, it was the Farming Today podcast from BBC Radio4! You mean they’re the only variety of cooking apple? I’m not sure I’ve seen any other varieties now you mention it!